We’ve found three technology “hacks” to keep your phone from buzzing along with everyone else’s at 2:18. At 2:18 PM Eastern Time on Wednesday, every cell phone in America will buzz, beep, or maybe play a jaunty tune. Everyone will receive a special, handy-dandy emergency broadcast sent by the White House. 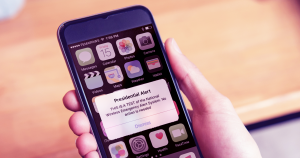 The test of the National Wireless Emergency Alert System, which was supposed to happen in September but was pushed back, will join the ranks of Amber Alerts for missing children and those flash flood warnings that you only seem to get on sunny days — yet another thing that makes your pocket buzz but typically doesn’t affect your day-to-day life all that much. Granted, these alerts are actually from FEMA and are intended to warn us about natural disasters, cyberattacks, and acts of war (they are at the directive of the president but they don’t actually contain a message from President Trump). But the audacity of the federal government to contact us in a way that is so personal and immediate — let alone all of us at once — has left many wondering how to opt out. The consensus among media reports, such as in WIRED’s oral history of the alert, is that we’re SOL. But we’re not giving up. Here are the top three strategies we’ve come up with to stop your phone from buzzing on cue for today’s emergency alert. If you go to your phone’s settings menu, you’ll have a number of ways to limit the notifications that your phone sends your way. On a Droid, you’ll find an Emergency Alerts app that you can’t disable or uninstall, but you can hit the “force stop” button. Note that the app will start back up after a few minutes, so your best bet will be to strategically time the force stop before 2:18. On an iPhone, you can turn off “government alerts” in your notifications settings, but that may be just as useless as hitting the “close doors” button on an elevator. More extreme measures might be in order. You can’t get the message if you’ve got nothing to receive it on, right? We’re betting that turning your phone back on at 2:19 will just delay rather than cancel the alert, so you really need to commit to this one. And if you want to avoid accidentally turning your phone back on in your pocket, we have one more idea.